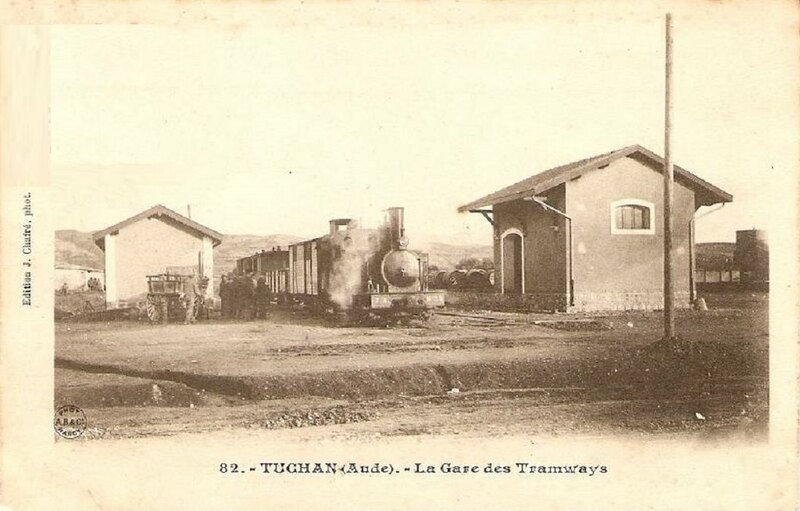 This next journey along Les Tramway de l’Aude begins in the town of Tuchan in the Southeast of the Departement of Aude. 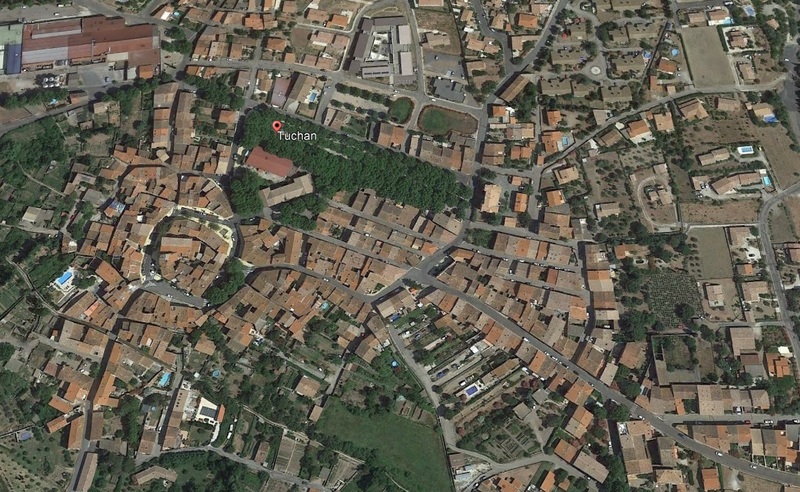 The small town of Tuchan – the tramway station was off to the bottom right of this satellite image. 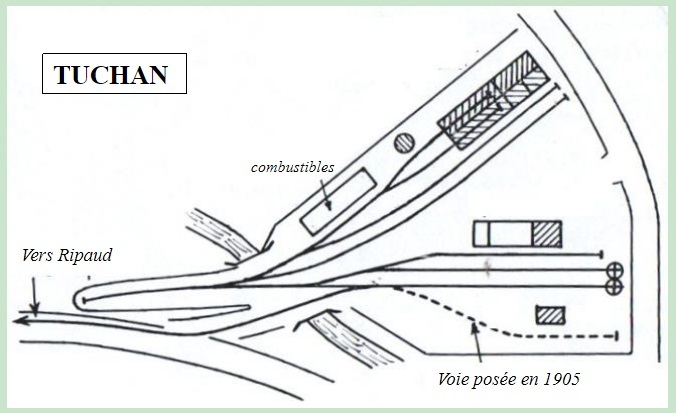 A schematic drawing of the station site. 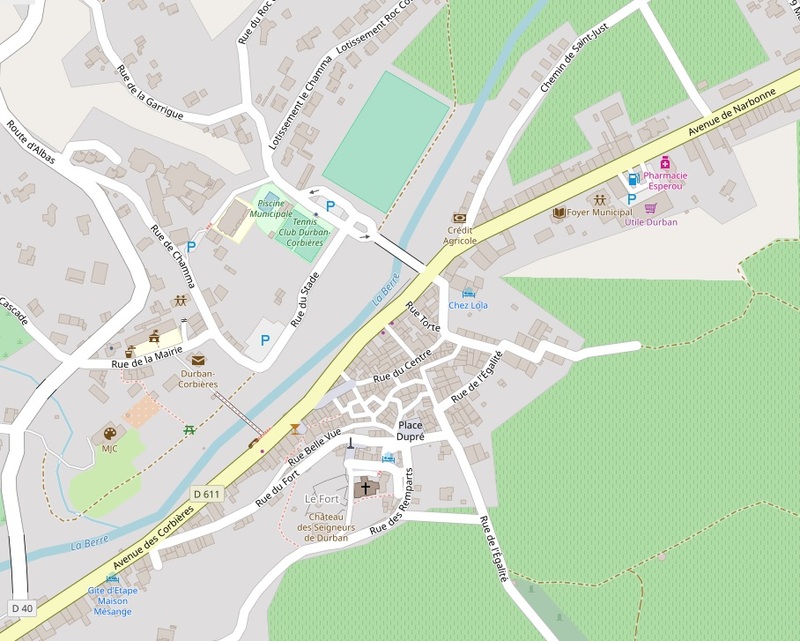 The watercourse shown on the sketch will not be the River Petit Verdouble. There was a mill close to the station site and it is possible that the watercourse shown would have been a mill-race! The sketch has the North point to the bottom of the image. 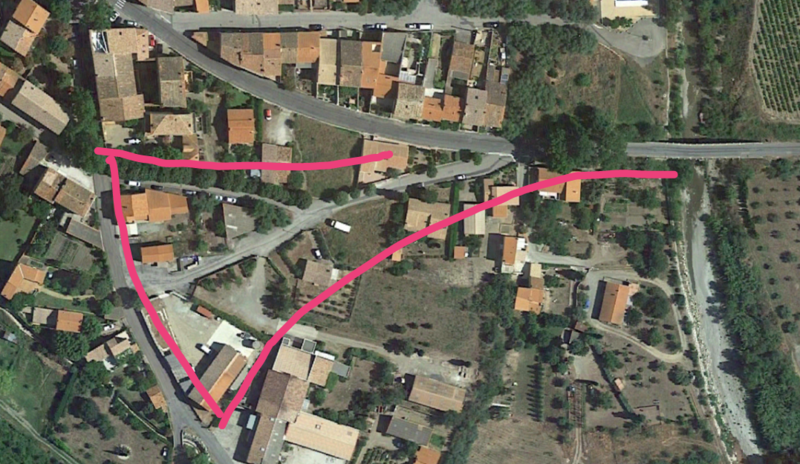 The old tramway station site is outlined in pink. 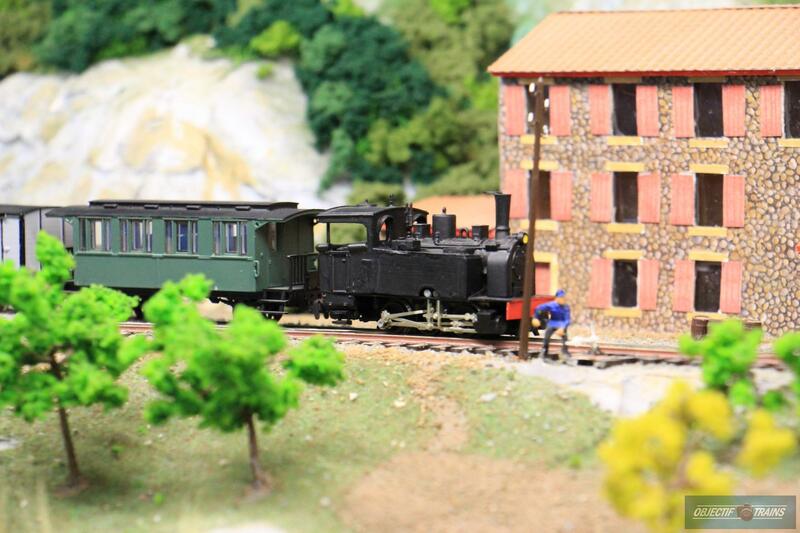 In the bottom corner, the old engine shed is still standing. 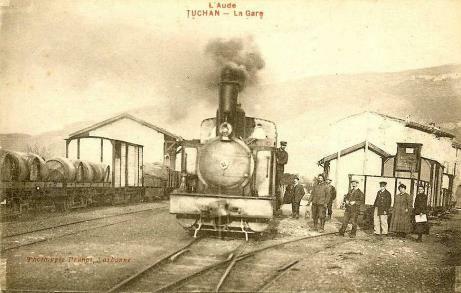 Immediately on leaving the station the tramway and the GC105 (D611) crossed the river to the East of Tuchan. 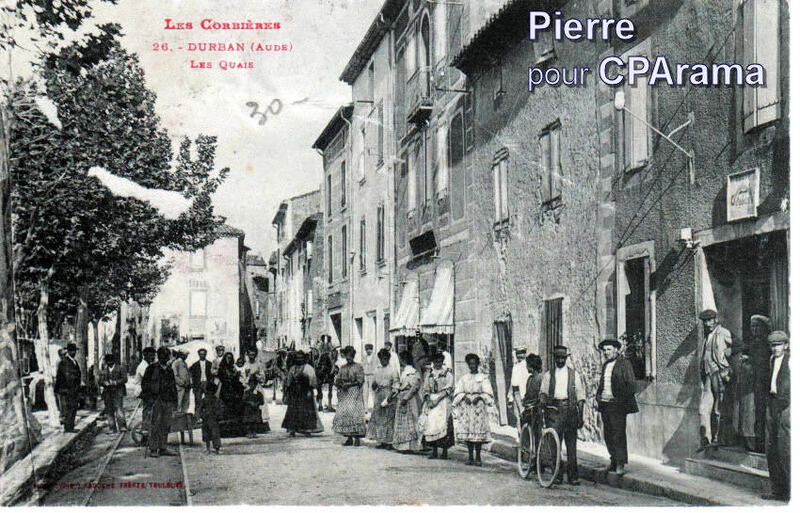 I have seen that river given two different names – Le Petit Verdouble and Riviere du Mas de Segure. 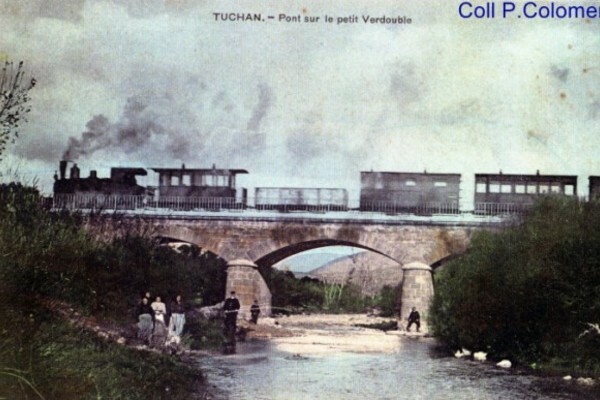 The images below show trams crossing the bridge over the river. 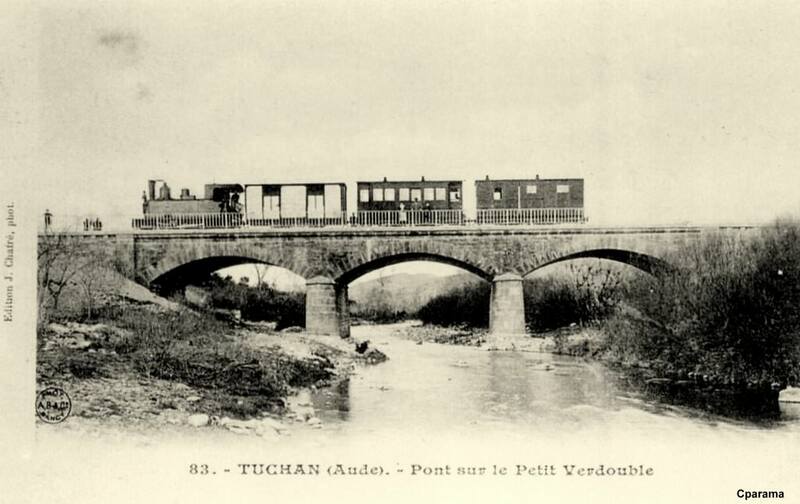 The two images above show trams on Le Pont sur Le Petit Verdouble close to Tuchan. . 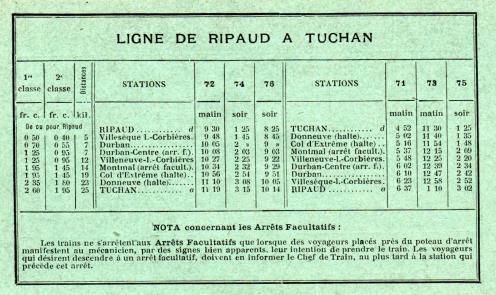 The 1930s map adjacent to these notes shows the tramway route from Tuchan to Durban via Villeneuve-les-Corbieres. 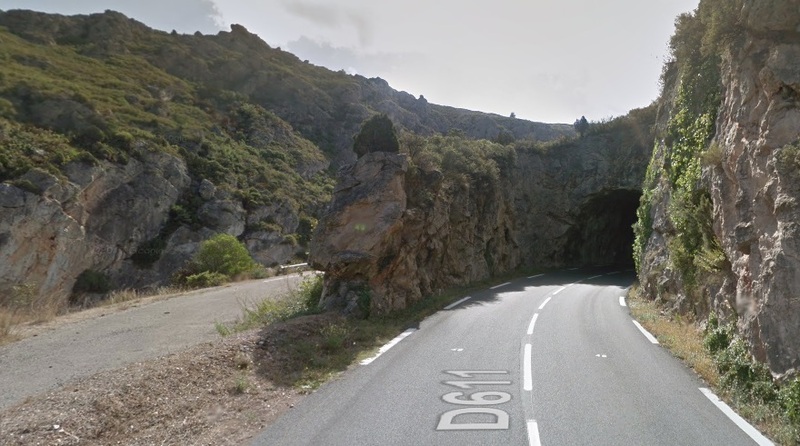 The tramway climbed about 100 metres from Tuchan to the Col d’Extreme before dropping down about 120 metres into Villeneuve. 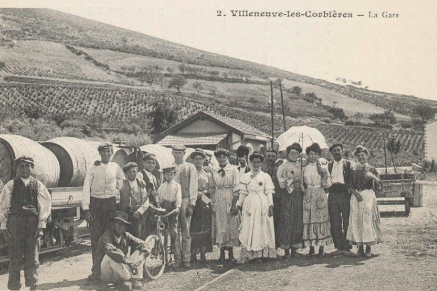 The distance to Villeneuve tramway station was about 14 kilometres. 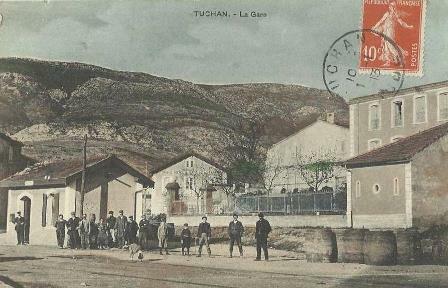 The first few kilometres Northest from Tuchan followed a gentle grade through vineyards with the trams running on the eastern shoulder of the GC105. After just over 2km the road and tramway crossed the Riviere du Col d’Extreme. The modern D611 has its own new bridge. 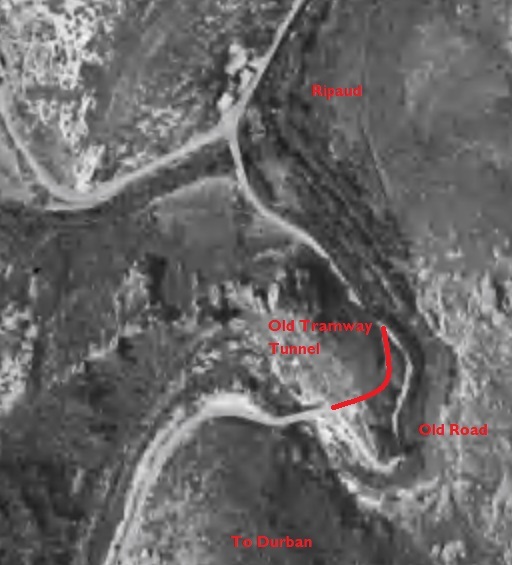 The old GC105 and the tramway route can be seen on the image on the North side of the modern road in the image above. The hills around the road begin to close in and the valley begins to narrow from this point although the gradient of the road remained relatively shallow for a few more kilometres. The tramway continued to follow its eastern shoulder. 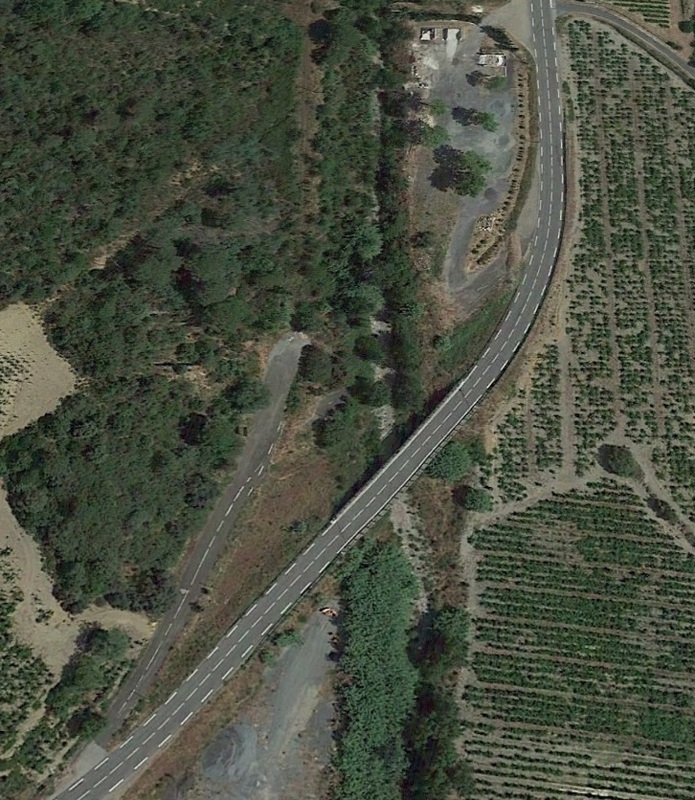 The image above, together with the adjacent satellite image  leave some significant questions about the actual alignment of the tramway. The 1930s Michelinn Map above suggests that the tramway followed the route of the modern road to the East of the River. 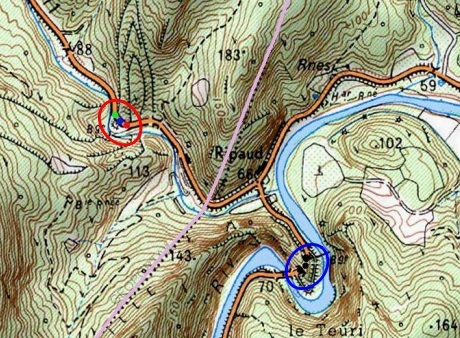 However, the 1942 aerial image shows two alternative possible routes for the tramway, one on each side of the Riviere du Col d’Extreme. Reviewing the 1950s 1:50,000 IGN Map leaves the question open. It is not clear what route the tramway followed, but I should be inclined to accept the route given by the 1930s Michelin Map. 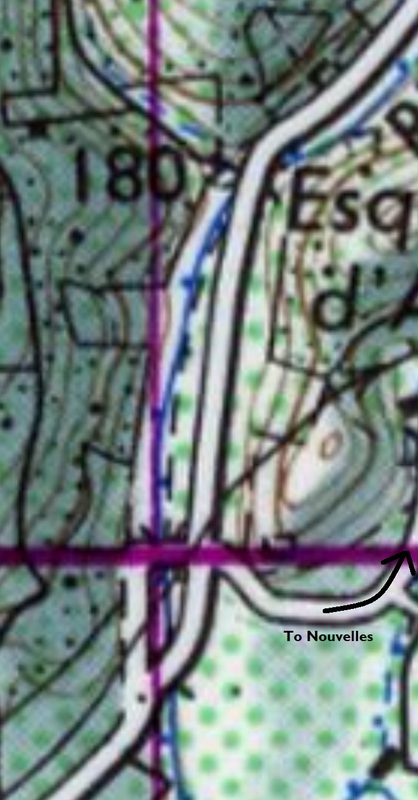 which would match the thicker roadside line on the 1950s map above. 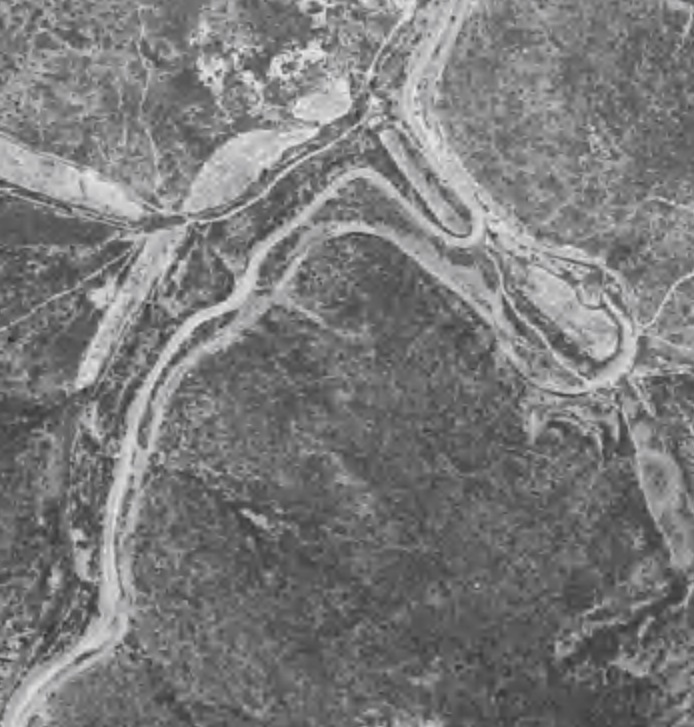 Perhaps the road in the period before the 1930s was aligned to the West of the river and the tramway to the East. 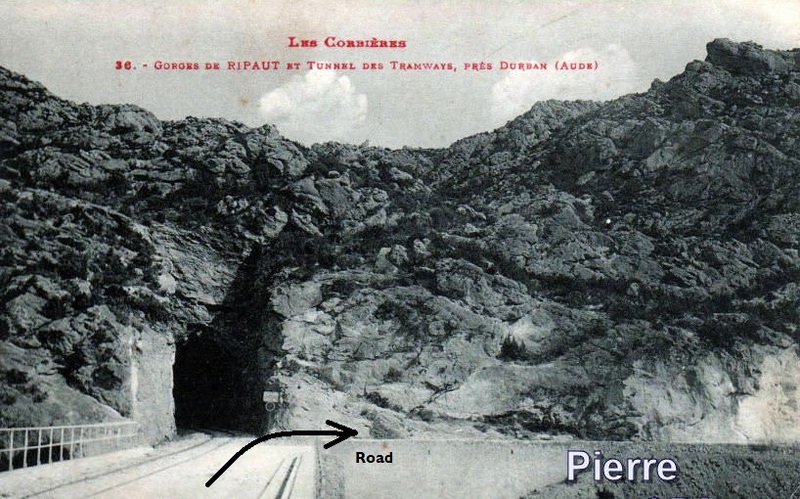 The road may then have been realigned to follow the tramway in the period prior to the making of the Michelin Map. I can find no conclusive evidence. The tramway and the GC105 remained distinct from each other for around a kilometre North of the Col. Both dropped quickly away from the summit but the tramway needed a gentler decent than the road. The earthworks associated with the modern D611 seem to have obliterated the old tramway and GC105 road. 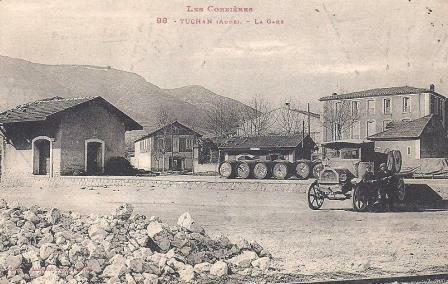 On the decent to Villeneuve-les-Corbieres the tramway switched to the western shoulder of the GC105. I could find little or no evidence of the tramway along this stretch of the modern D611, except perhaps some old bridge abutments! I guess the evidence is tenuous at best, but we do know that this was the route followed by the tram and that the tracks ran on the West side of the GC105 (D611), so it is just possible that the concrete blocks visible beyond the modern bridge railings below are remnants of the tramway? 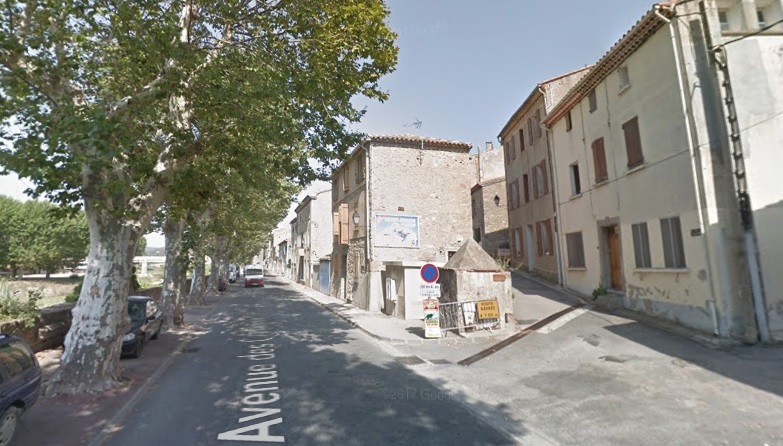 When the road and tramway reached Villeneuve-les-Corbieres they curved to the East through the old village centre. 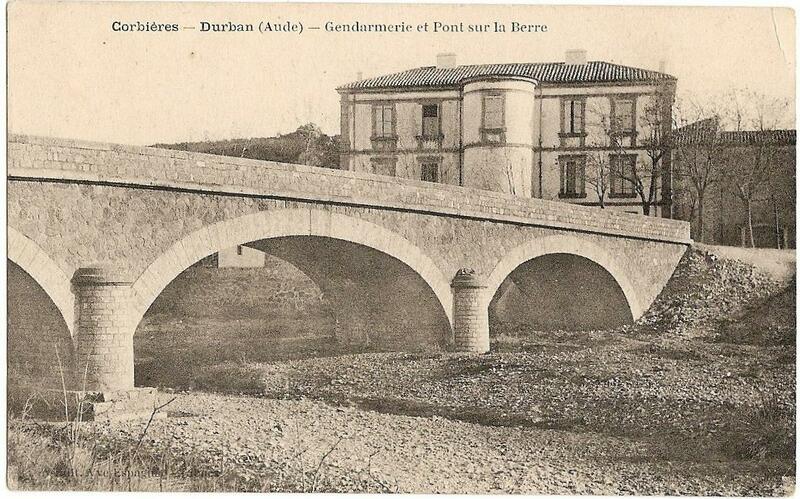 The Michelin map from the 1930s shows a small village on the South side of the River Berre. 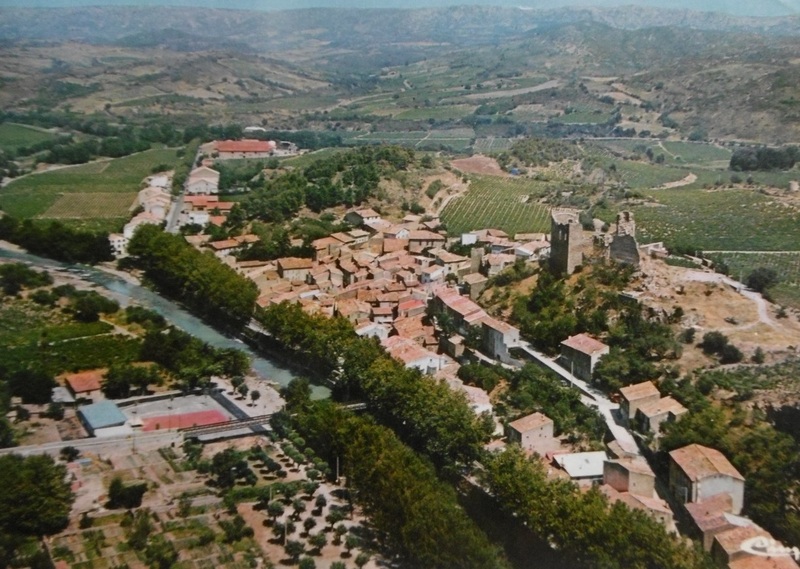 The village has extended across the river and the two banks of the river are linked by a series of bridges. 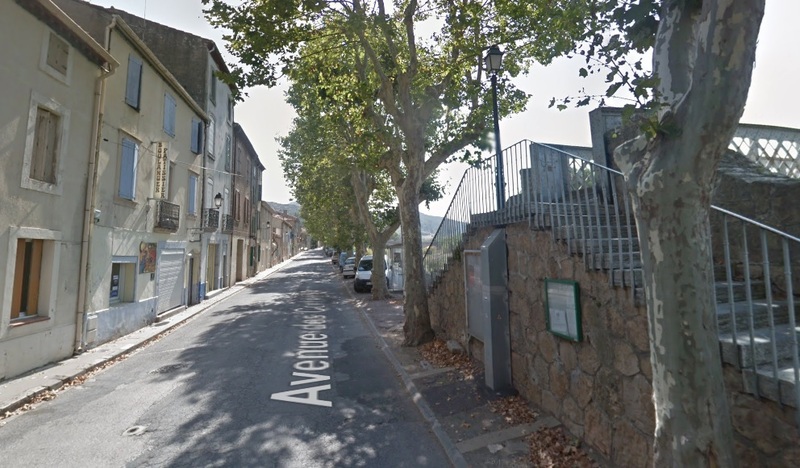 A Google Streetview image which shows the three bridges crossing the river bed in Villeneuve-les-Corbieres – this is taken from the far bank. 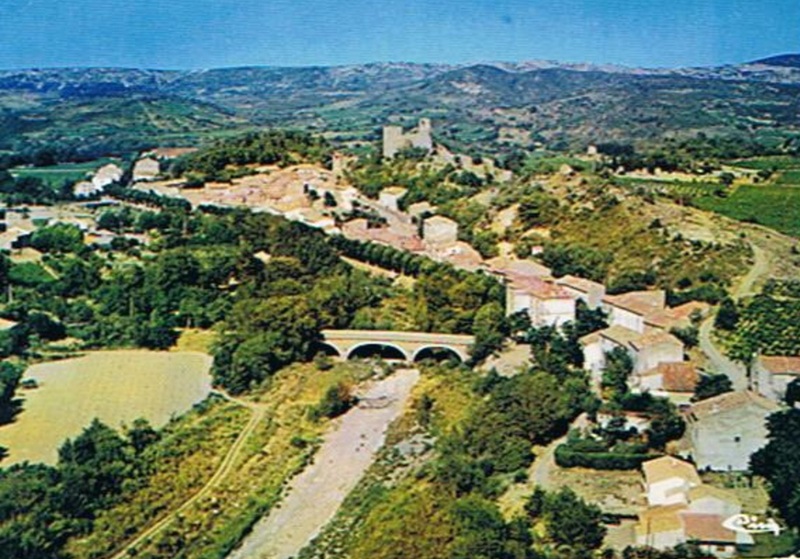 The old village is ahead across the river and the tramway and GC105 were beyond. 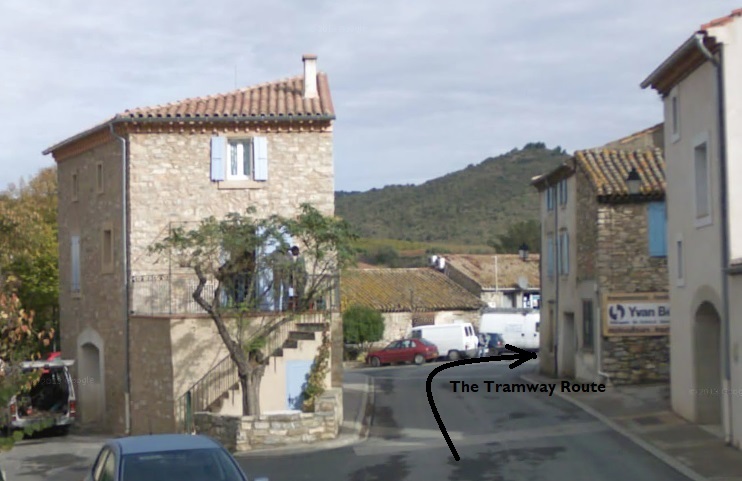 The tramway route through Villeneuve-les-Corbieres. 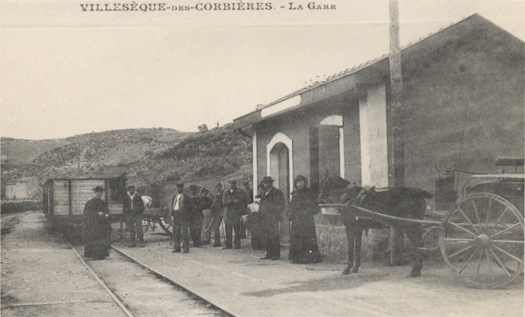 After passing through thenheart of the old village, trams encountered the tramway station close to the River Berre and to the East of the village. 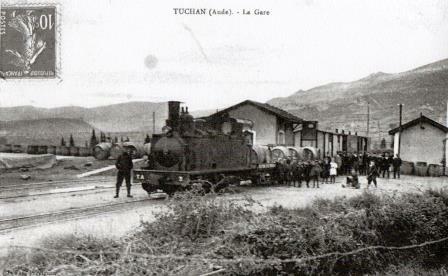 The GC105 (D611) left the village heading East and the tramway station was encountered on the first significant piece of open ground alongside the road. 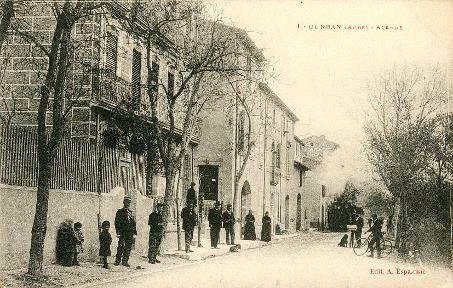 The first house on the left of the picture appears in one of the 21st Century images below. The two images immediately above take us much closer in on the station! The first is an exceprt from the earlier image. 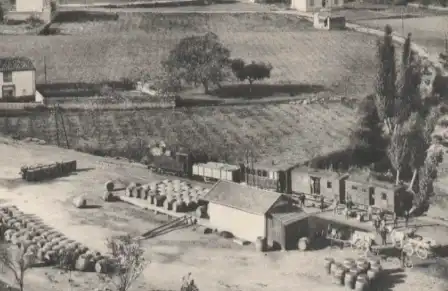 Wine was clearly a major commodity carried by the tramway! Looking from the village towards the station site in the 21st Century. 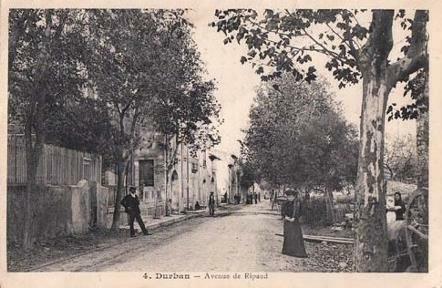 The house on the left is the one noted in the monochrome image of the village taken from the South and shown above. 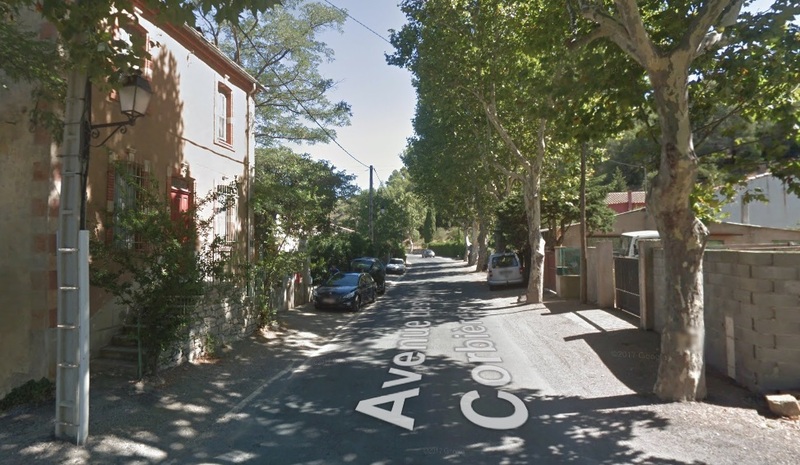 Still travelling in the same direction, this is the approximate location of the tramway station at Villeneuve-les-Corbieres. 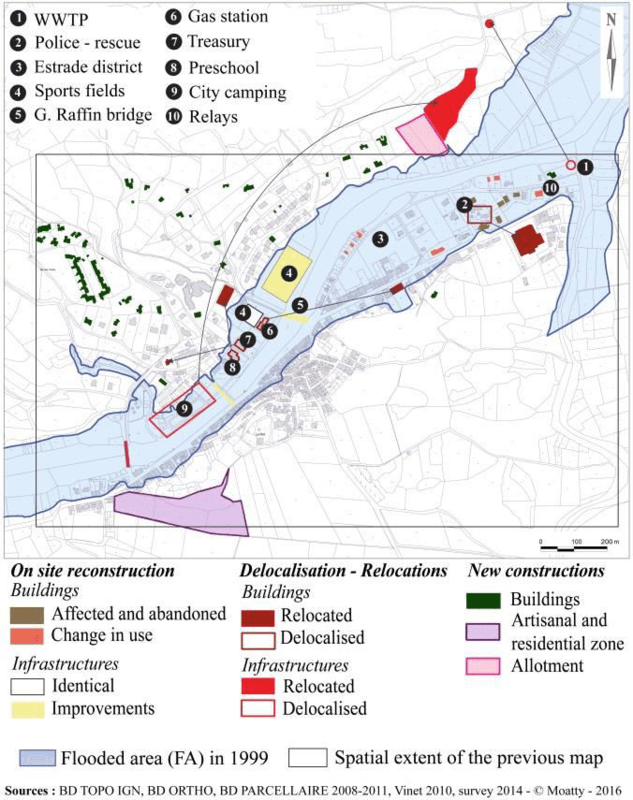 There is nothing of the station left to see and in the 21st Century there has been significant development on and around the site. 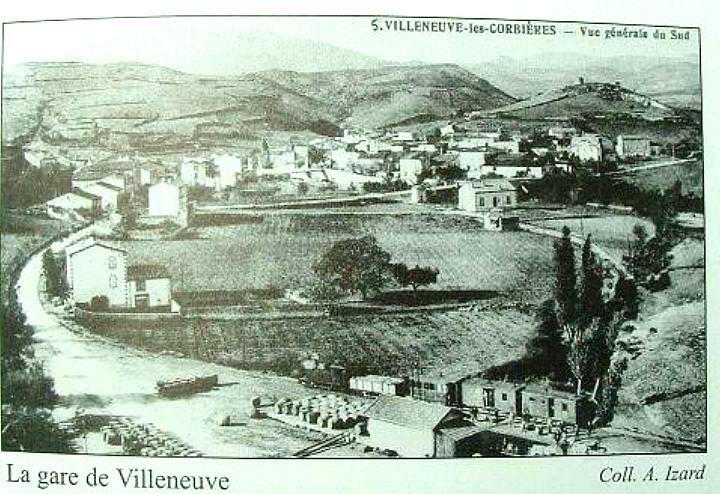 This view of the old station site is taken from a minor road on the North side of the River Berre. 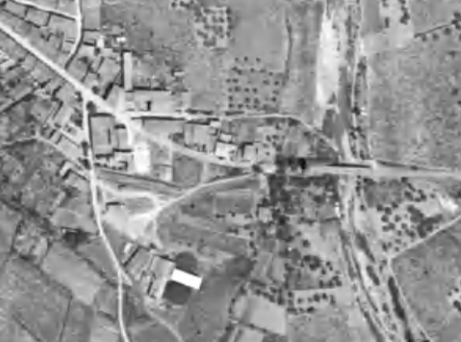 The single storey buildings are built on what seems to have been the station site. 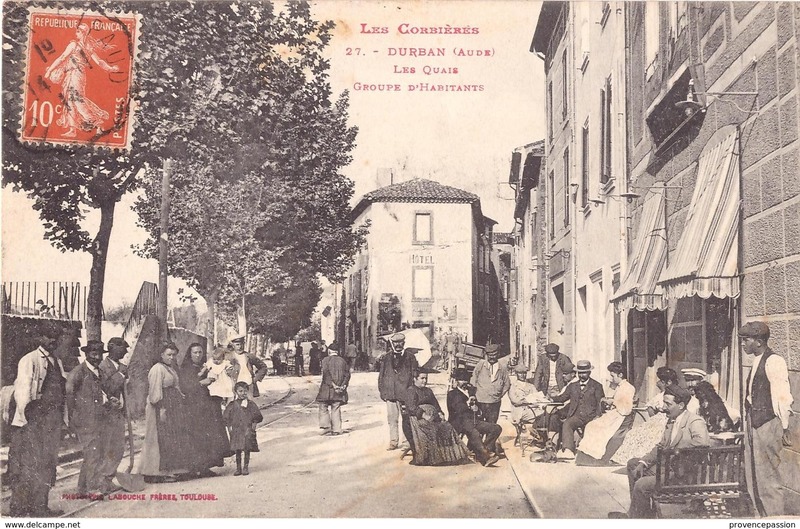 The tramway and GC105 followed the valley of La Berre from Villeneuve-les-Corbieres to Durban. 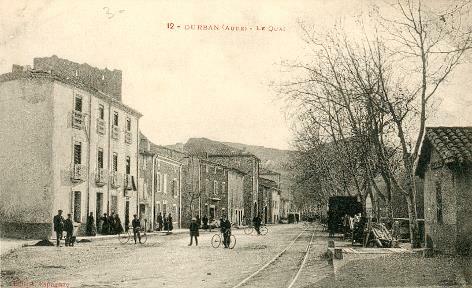 It approached Durban Corbieres from the West and remained on the line of what is now the D611 through the village. 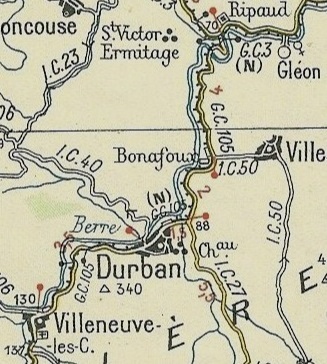 The route is confirmed on the adjacent 1930s Michelin Map which shows the line on the North shoulder of the ols GC105 between Villeneuve and Durban. 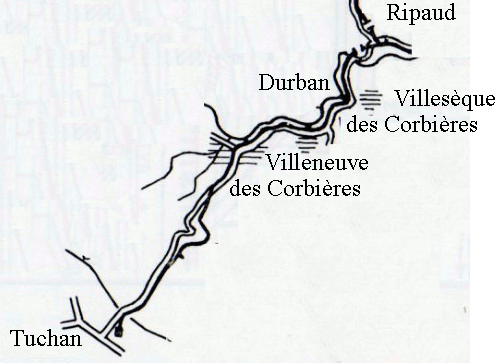 The location of the station can also be picked out to the East of the village of Durban and on the North side of the GC105. 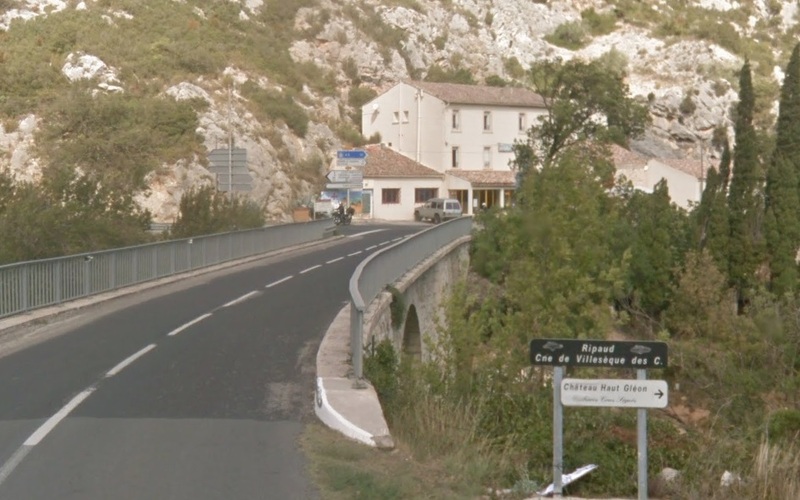 Worthy of note is that in the 1930s the village is shown on the map as being completly to the south of the river Berre with one bridge crossing the river and carrying the IC40. 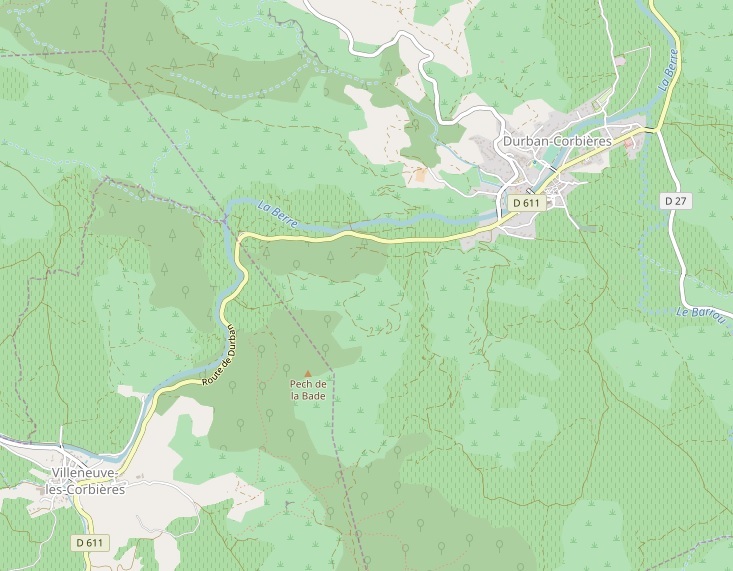 on the OpenStreetMap image above there are two further bridges shown to the East of the IC40 bridge and the village has expanded significantly to the North of the river. 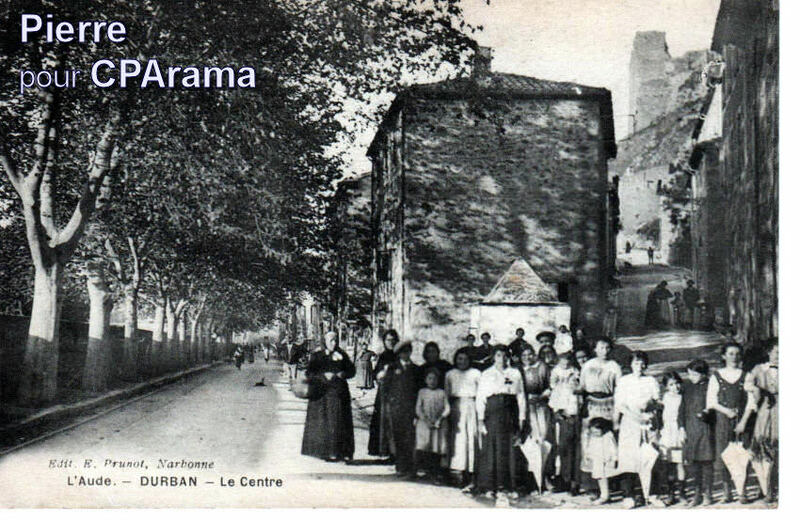 Durban is a town that has experienced its fair share of natural disasters. There have been significant floods over many centuries. 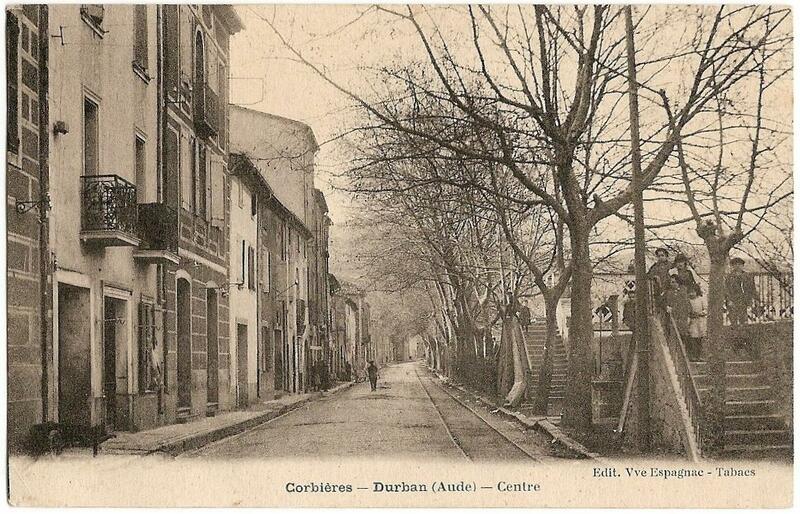 The historic postcards below show a range of different locations along the Avenue de la Gare which later became the Avenue des Corbieres and the D611. In the pictures the flood defences vary from something quite elaborate, with steps to allow access to the top of the wall, to plain walls. 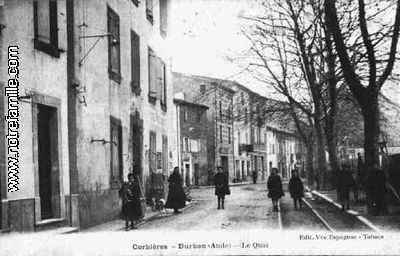 The first series of pictures below centre around the junction between the modern Avenue des Corbieres and the Rue du Fort. In this image there is a plain flood-defence wall on the left. 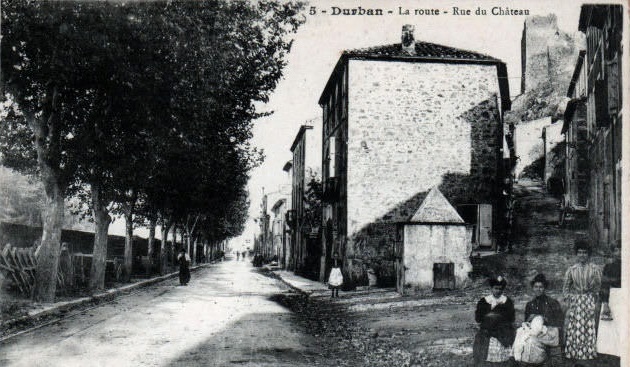 The road to the right is Rue du Fort and the Fort can be seen at the top of the hill. The tramway can just be picked out in the carriageway on the left of the picture  The same location on a different location. 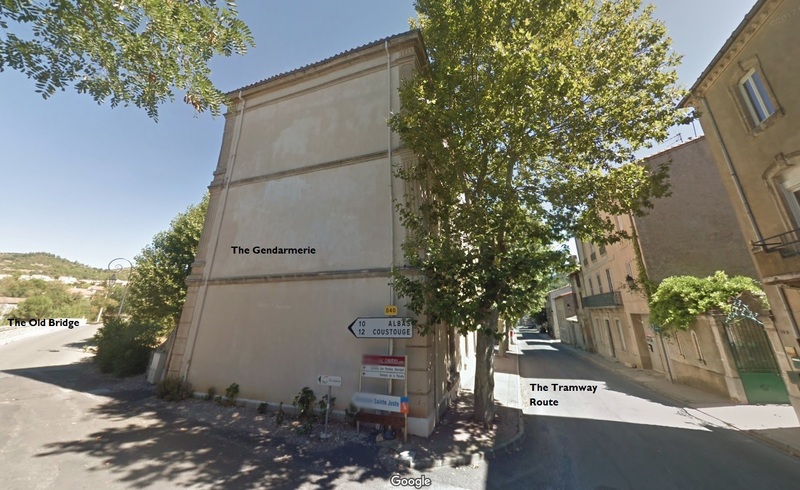 The tramway is more obvious in this image. The picture was taken from a point slightly further to the West along the flood-defence wall. 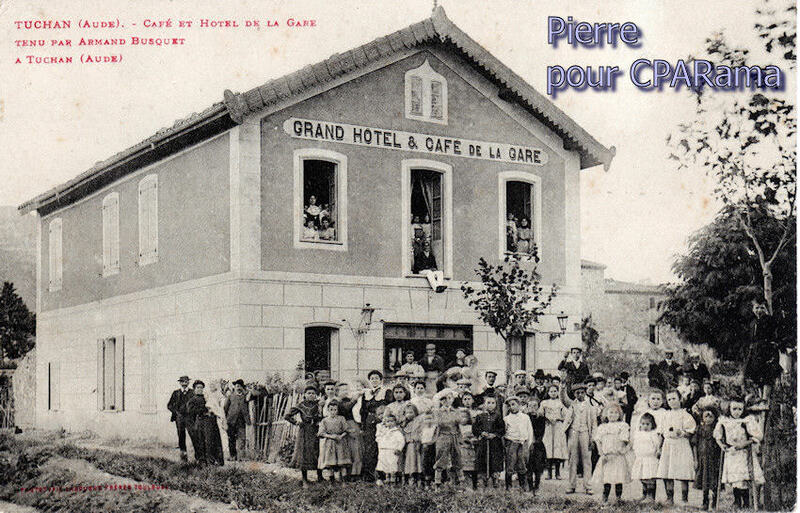 The same location in the 21st century. The flood protection now appears almost non-existent. A little further East and looking back to the West. the steps to the level of the top of the flood defences are on the right of the picture and there is evidence about halfway up the right-hand side of the image of the lattice girder bridge across the river. A similar image in the 21st century. 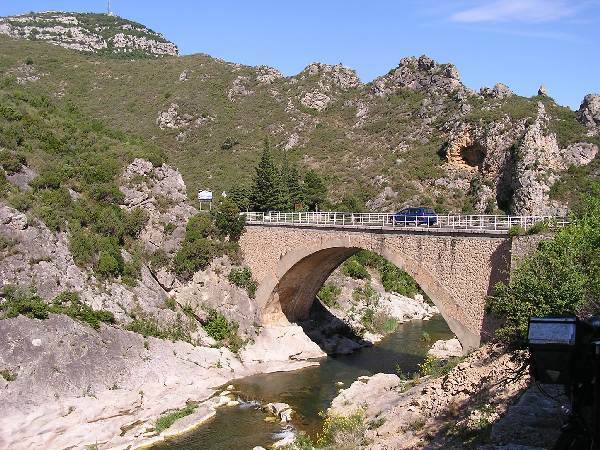 These are now the only steps to a higher level and provide access to the lattice girder bridge over the River Berre. 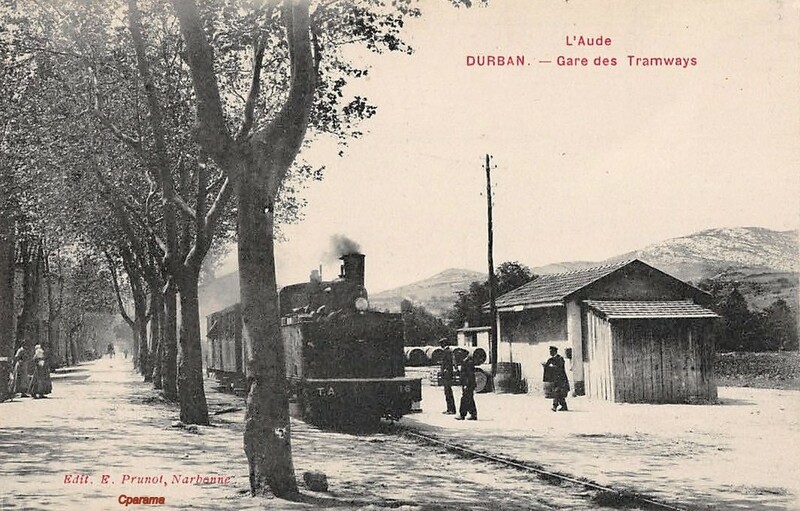 From Durban the tram passed through one more station before reaching the junction at Ripaud. 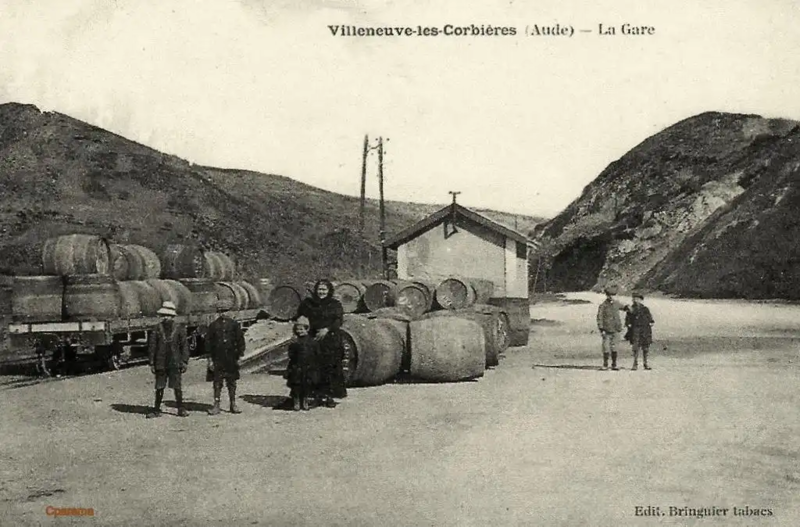 The stop for Villeseque des Corbieres was on the main road a distance West from the village. 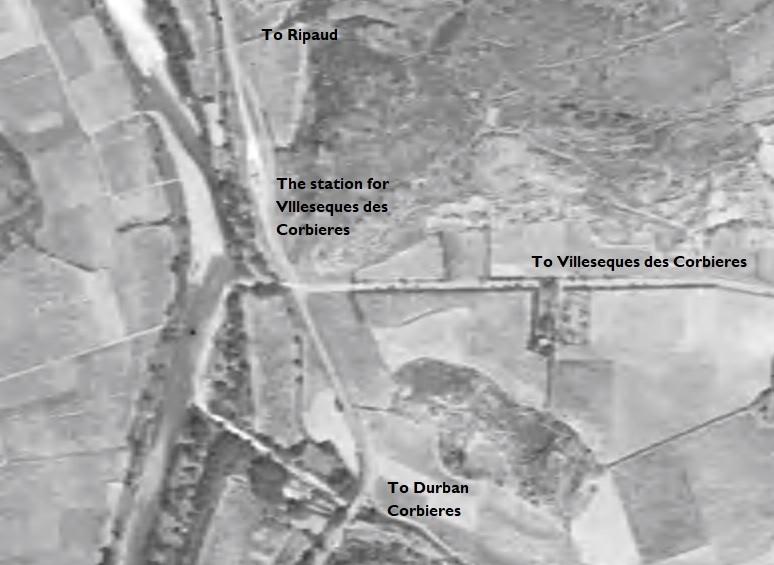 The site of the station was just to the North of the junction between the GC105 and the IC50 to Villeseque. 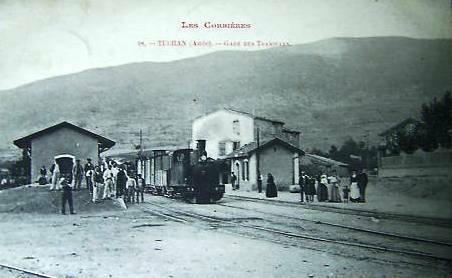 After the station for Villeseque the tramway and the GC105 headed North towards Ripaud. 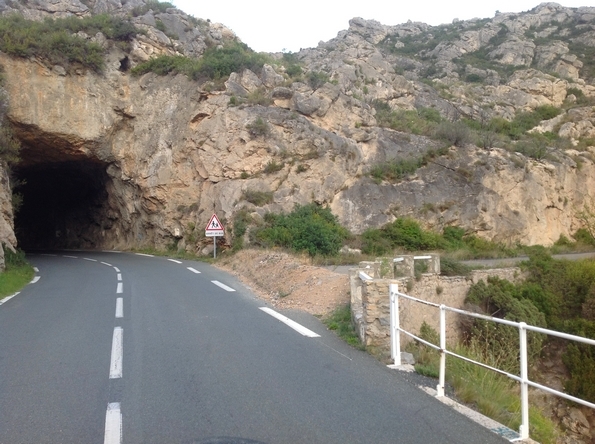 Both road and tramway followed the eastern bank of La Berre with the cream way on the western shoulder of the GC105. 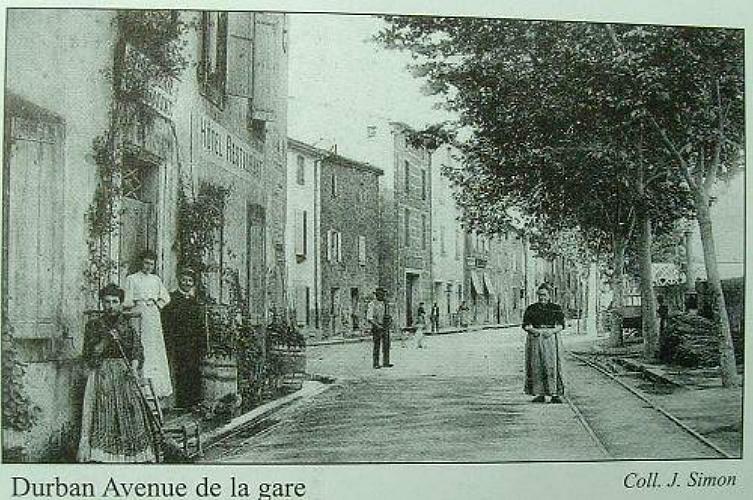 Within a kilometre of Ripaud the river alignment was such that the road and tramway could not continue to follow its East bank. 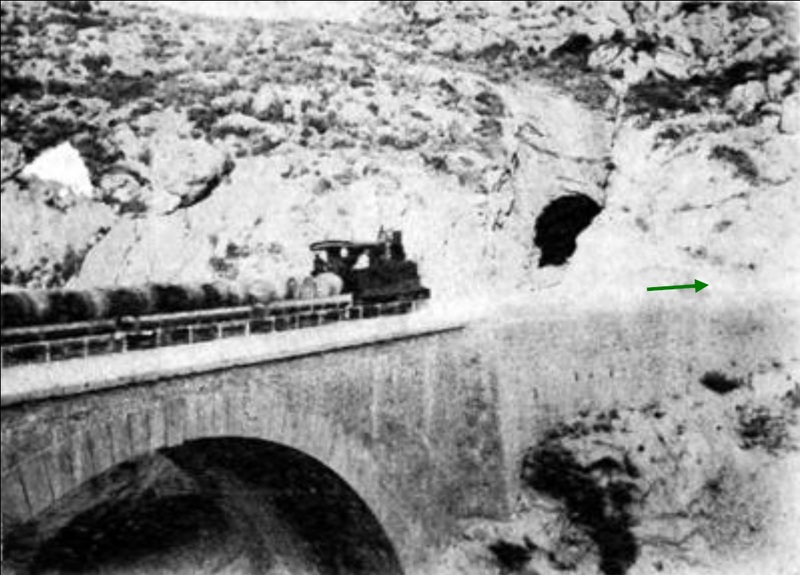 The GC105 and the tramway crossed to the West bank and the tramway then entered a short tunnel. 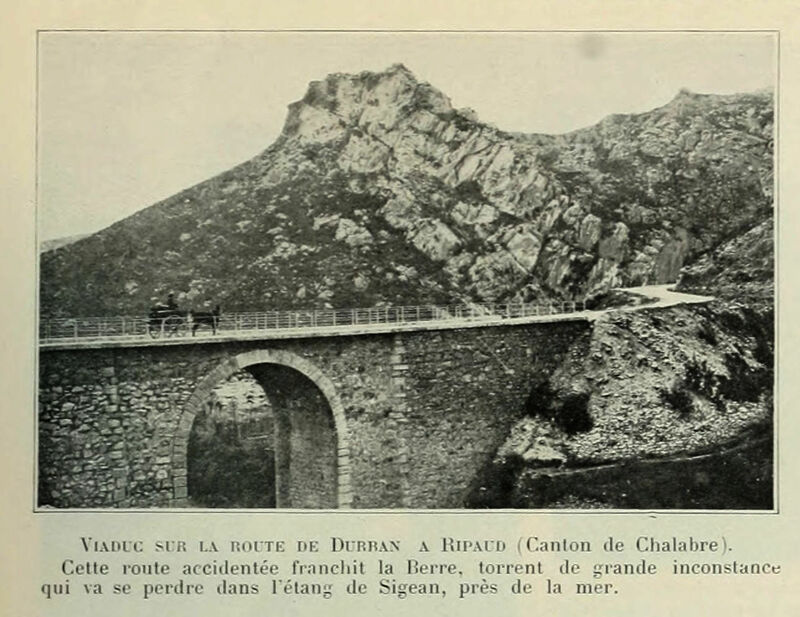 The road and tramway crossed the River Berre on a single span bridge. 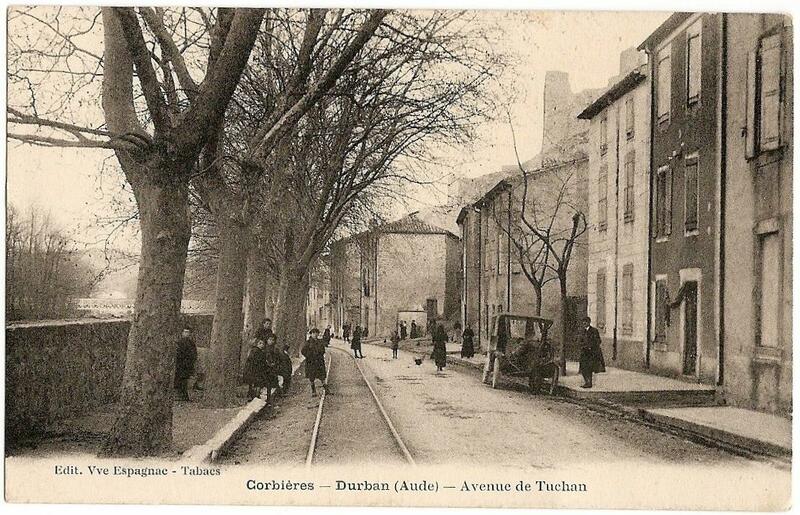 https://www.cparama.com/forum/tuchan-t246-60.html, accessed on 21st October 2018.
http://association-amis-aguilar.eklablog.com/cartes-postales-anciennes-gallery16764, accessed on 21st October 2018.
http://www.cpaaude.fr/THEMES/TRAMWAYS/index_fichiers/Page3035.htm, accessed on 21st October 2018.
https://remonterletemps.ign.fr, accessed on 22nd October 2018.
http://www.thezandescorbieres.com, accessed on 15th October 2018.
http://www.cpaaude.fr/THEMES/TRAMWAYS/index_fichiers/Page2790.htm, accessed on 23rd October 2018.
https://www.cparama.com/forum/villeneuve-les-corbieres-t1029.html, accessed on 23rd October 2018.
https://www.communes.com/cartes-postales-anciennes-durban-corbieres, accessed on 24th October 2018.
https://www.cparama.com/forum/durban-t251.html, accessed on 24th October 2018.
http://noriadurbanaise.id.st/durban-hier-c356269, accessed on 24th October 2018.
https://www.delcampe.net/fr/collections/search?term=durban%20corbieres, accessed on 24th October 2018.
https://www.researchgate.net/figure/Reconstruction-and-development-of-Durban-Corbieres-following-the-November-1999-floods_fig2_309345160, accessed on 24th October 2018.
http://www.cpaaude.fr/THEMES/TRAMWAYS/index_fichiers/Page3036.htm, accessed on 24th October 2018.
http://www.cpaaude.fr/THEMES/TRAMWAYS/index_fichiers/Page2855.htm, accessed on 24th October 2018.
http://www.tunnels-ferroviaires.org/tu11/11152.1.pdf, accessed on 25th October 2018.
https://www.cparama.com/forum/ripaud-t1058.html, accessed on 25th October 2018.
http://www.gite-corbieres.fr/2014/09/se-baigner-en-riviere, accessed on 25th October 2018.
https://randoslondres.wordpress.com/2010/09/24/etape-1-corbieres, accessed on 25th October 2018.
http://informations-documents.com/environnement/coppermine15x/displayimage.php?pid=32231, accessed on 25th October 2018.
http://www.rmweb.co.uk/community/index.php?/topic/136974-tramways-de-laude/page-2, accessed on 29th October 2018.